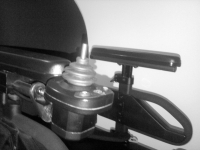 Often, those in-the-know in the wheelchair industry – clinicians and such – ignore my entirety, and hyper-focus on the shaft of my joystick, transfixed by its abnormalities. They’re bold enough to ask me why it’s so short, without a big knob? They stare at it, sometimes pinch it between their fingers, roll it around, and it makes me uncomfortable – violated. I tell them that it’s been that way since I was a child, that it’s easy for me to grasp, that due to my cerebral palsy, a big knob would be too cumbersome. But, they never seem to agree, all but mocking my physicality, insisting that I should have a big knob above all else. Apparently, somehow, if I just had a big knob, it would make them feel better – inside. Please tell me we are still talking about Power wheel chairs!!!! !